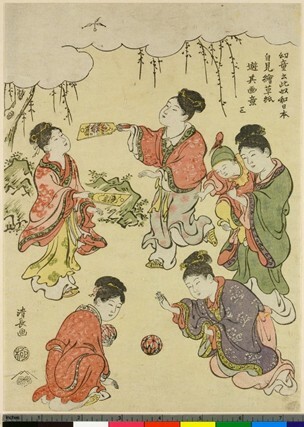 Pictured first is the ukiyo-e Japanese color print titled Cauldron Dance at Ninnaji by Yoshitoshi, a nice example of how western children's literature illustration owes influence to Japanese color prints, (e.g. the work of Walter Crane and Aubrey Beardsley). This post is dedicated to the 1 7th century Japanese, ukiyo-e school artists who made original designs for woodblocks to use to mass produce colorful, popular prints. In Ellis Tinios' gorgeous volume Japanese Prints. Ukiyo-e in Edo, 1700-1900 (2010), the author defines ukiyo-e as ‘picture’ (e) of the floating world’ (ukiyo), a Buddhist expression meaning transient world of sorrows from which to seek release, but later meaning earthly pleasures of Edo (Old Tokyo), Japan. There are two sizes of prints, large oban and narrow hasoban, and four main print subjects, actors, alluring women, landscapes, and warriors, according to Tinios. The British Museum has collected these prints since 1851, and now makes them accessible online at at www.britishmusuem.org. 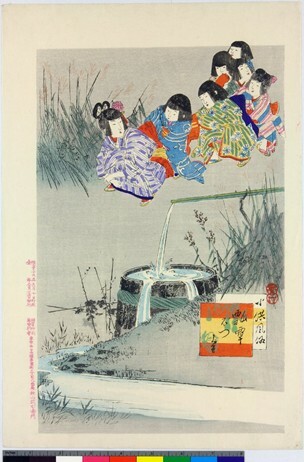 Check out these images from the ukioy-e collection in The British Museum. In this print, the artist recognizes the educational value of picture books to children. It is titled Chinese Children Learn about Japan from Looking at Picture Books, Games, by Torii Kiyonaga. 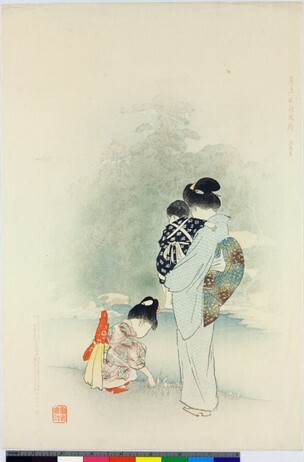 Artist Miyagawa Shuntei's images of children use both bright flat colors and graceful, pale nature hues characteristic of the Japanese color print. The Shuntei prints below are on the left Pine-Cone Gourd Game, Scenes from Childhood and on the right Botanical Gardens - Famous Places in Tokyo. Here's hoping you enjoyed this post. 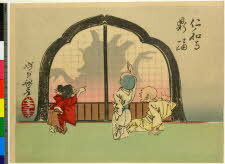 In the next post, I discover elements of Japanese color prints in western illustrations for children.